Since switching jobs this fall, I’ve thought a lot about the writing life and how you go about making time to write. Writers bemoan the lack of time they have to dedicate to their craft more than any other group of people aspiring to something. There are dozens of articles written– by writers who apparently can find the time to do it– about how to succeed as a writer. It’s easier if you have a spouse that can support you, they say. It’s easier if you are a man, they say. You are more likely to succeed if you have only one kid or no kids, or you have a tenure-track job instead of an adjunct position, or you have a non-creative arts job or a creative arts job, a non-writing job or a writing job, no job at all or job security. Writers everywhere are looking over the fences and assessing each other’s grass to determine who has it better or easier or worse or harder in some frenetic attempt to assess one’s position relative to the rest of the writing world. Hmmm, looks like she has blue fescue and I only have Kentucky bluegrass, and his lawn is all crabgrass but look how freakin’ productive he is in spite of his weedy lawn. The nerve. So much energy and emotion is wasted in this comparative analysis. Pride and envy get blended with a little navel-gazing until we’re just exhausted. Look at all of those other writers, those successful writers, writing all of the time, in spite of or because of their circumstances. It’s not fair. “Oh, if I only had more time to golf,” my husband says. So he makes more time to golf. Just do it. Just go out there and write. Do it. 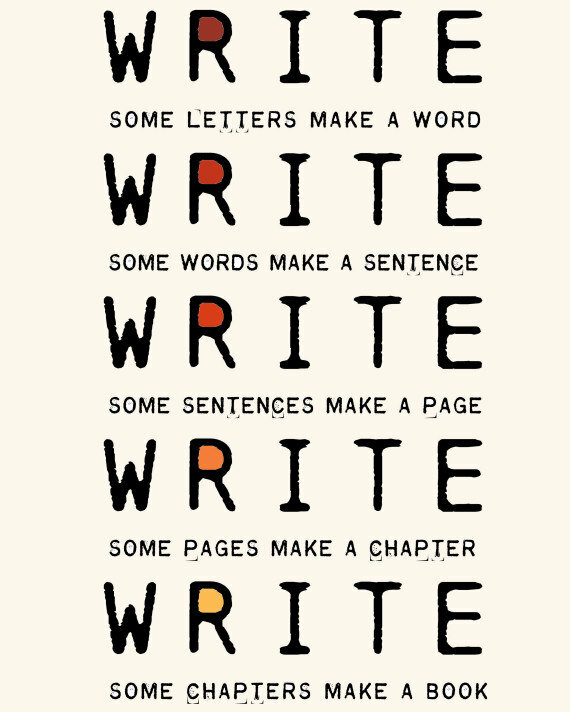 Resolve to, whether you have children or don’t, whether you are married or not, whether you are working or unemployed, whether you love or hate your job, if you want to write, just write. Just do it. You want to write, so do the thing. It is not so painful. You are writing words on pages, you are opening your heart and your mind. Write something playful if the painful is too painful. Write something other if the self is too vulnerable. Open a notebook or a Word doc or a journal and write already. You will only find time to write if you find time to write, so find time to write, in the crevices of your day, when you are idling at a stoplight, write in your head or in your phone’s notes app or on a legal pad, write while you fold laundry or in between flipping pancakes in the morning, write after the kids go to sleep or the dog goes to sleep, write instead of watching another episode of American Idol, don’t idle, write instead of scrolling through Facebook, write while you are on Facebook or Twitter, make each tweet you send out into the world a poem a sentence the briefest fiction the most succinct piece of prose you could compose today and then kiss it on its way into the world, write, write, write, log the thought away until the sun sets or until you need a coffee break or while you eat your lunch, write while your kids do their homework or on a pocket notepad in between waiting on tables, write on napkins, write on a schedule, write when inspiration hits, write for fifteen minutes before you leave for the rest of your day, make your day your poem your prose your composition pad, live your life so your writing is rich with the stuff of life and not the self-pity of envying other’s successes and your apparent failures, write because you want to, because you need to, because you have an itch to scratch a thought to develop a ponder to wonder upon until it’s pushed to its limit in your life, write, write, write.